Blackie, the beloved sway-back horse from Tiburon, is immortalized in a New Edition of the classic illustrated children’s book. Sixty-four pages with 45 beautiful full-color illustrations in a compact 6½" x 8" size. Born on the Kansas plains, Blackie likes to stay in one place rather than risk missing anything, but is gently persuaded to try his hoof as a rodeo horse, a ranger’s mount in Yosemite National Park, and a town mascot in the California coast town of Tiburon, and finds love wherever he stands. 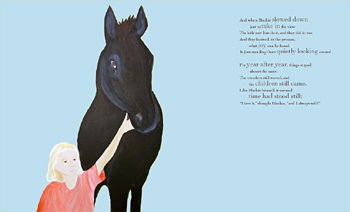 The life and times of this stubbornly motionless equine hero is delightfully told in BLACKIE, The Horse Who Stood Still, a touching biography-in-verse by Christopher Cerf and Paige Peterson, magically illustrated with 45 full-color illustrations by Paige Peterson. 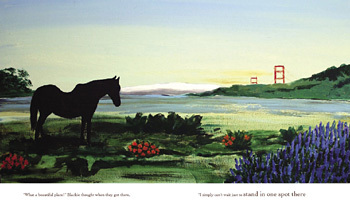 64 pages with 45 full-color illustrations - 6.6" x 8.1"
We're happy to announce that Blackie, The Horse Who Stood Still has been selected by Chinaberry (www.chinaberry.com) to be in their catalog, which for 24 years has offered select quality childrens books. Chinaberry offers items to support families in raising their children with love, honesty and joy to be reverent, loving caretakers of each other and the earth. It is an honor for Blackie to be included in this catalog.